The first time I used the mask, I applied it on my face quite thinly, (due to its consistency), and left it on for 15 minutes, and then I washed it off. Once on your skin, within the first minute you get this stinging sensation, that kind of feels like burning. The sensation is not very pleasant at all, but it doesn’t last for that long, so is pretty bearable. Before I go any further, may I just add, that due to the thick consistency of this product, it was really hard to wash off. With scrubs and masks, I tend to remove them, with my hands and warm water. With this mask (or rather masque), after rinsing my face with water 3 times, I STILL had product on my face. After seeking additional help from my trusty face towel (flannel), I managed to remove the leftover product. My skin felt very, very DRY after using it. Now FYI, my skin type is dry and sensitive, but this mask made it even drier. I was very disappointed as I had read numerous reviews that waxed lyrical about this product. I decided to give this product one last try, as I refused to believe, that this product wouldn’t work for me. 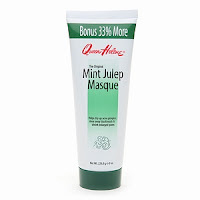 After reading other reviews on this product, a lot of people recommended leaving this masque on for an hour, or leaving it on overnight for optimal results. Applcation Method: I didn’t wet my face before putting the masque on, I just put it on my dry face. I kept it on or about 50 minutes, and when I went to take the masque off, it had dried up and started to crack. As the product had dried up, it was even harder to remove than last time. However, unlike last time, when I did remove the mask, my face did not feel half as DRY, as it did last time, but really soft and smooth. Now the product claims to ‘rinse away blackheads (and) shrink enlarged pores’ but I have not seen such results. For optimal results, leave on for 45 mins- 1 hour/ when the product has dried to the cracking stage. All in all, the masque is alright, and not as AMAZING, as some people have claimed. If this masque was part of my skincare regimen, I would only use it once a week. The only reason why my first two applications, have such a short duration time between them is because I was retesting the product. Where can you get one from? I got one from Sabina. You can get your one from your local Afro Carribean hair and beauty supply store. Price -£2.49 (5/5) I think the price is pretty cheap and cheerful, and considering you get 33% extra product (59ml) for your money, as it’s a bonus pack, you can’t really go wrong. I would not recommend spending more than £3.50 on this product. Smell- Mint/ Toothpaste (1/5) I normally like the smell of mints and toothpaste, but in this product I did not like the smell. Texture/Feel- Toothpaste/Mud (1/5) I’m not a fan of the texture of the texture of the mask. IT's very thick and when it dries becomes hard which make it hard to remove. Overall rating 2.5/5. Would I repurchase No? This works wonders for skin.